Whether it’s banked track or flat track, get the word out about your upcoming bout with this flagrantly fun pre-event Flyer. 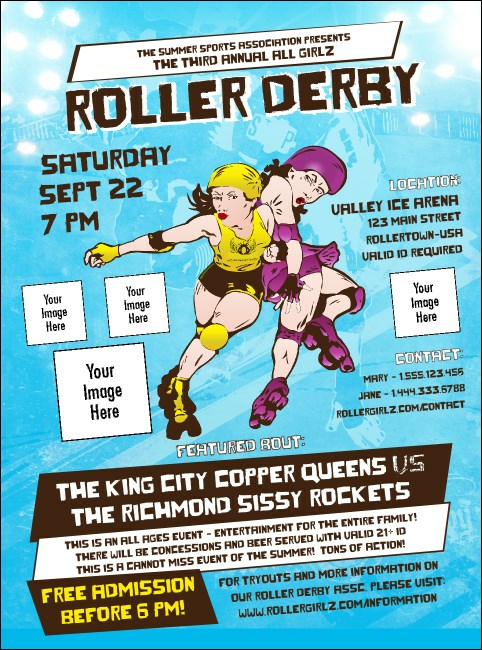 Roller Derby Jammer Flyers are just the kind of in-your-face advertising you need with a bright blue background and two tough derby dames in mid-battle. Upload four of your own images, like sponsor logos, or pictures of your own slammin’ sisters. Tackle pre-event promotions head on with Flyers from TicketPrinting.com.